Zorbing is an extreme sport in which a person or 2/3 persons rolls down a slope in a big double air-walled transparent spherical ball. Though generally performed on a slope it can be done on level surface or water also. The runs are about 500-800 metres and the sport was first introduced in Rotura, New Zealand. It is however now in vogue in many countries. The ball is a double-sectioned sphere, with one ball inside the other with an air layer between. This acts as a shock absorber for the rider, dampening bumps while rolling. Many balls have straps to hold the rider in place, while others leave the rider free to walk the sphere around or be tossed about freely by the rolling motion - water can be added inside, and this is commonly called a "water ride". A typical ball is about 3 metres in diameter, with an inner sphere size of about 2 metres leaving a 50–60 centimetre (20–24 in) air cushion around the riders. The inner and outer sphere are connected by hundred of connectors and filled with air. Caution: There have been couple of incidence of injury and even death of riders. So before embarking in this sport one must take into account all necessary safety precautions and check the safety features available at the Zorbing site. Here are few images taken at Rotura, New Zealand. Hi Jay, Glad that one of my photos could be used in your blog. My wife and I loved doing the Zorb, although I had a hard time telling which way was up for a few minutes afterwards! In addition to riding the Zorb dry (during which time you are strapped into a harness in the Zorb), you can also elect to have about 10 gallons of water added. With the water, you slip and slide around the inside of the Zorb as you are not strapped in. Thank you John for your comments and explanation. 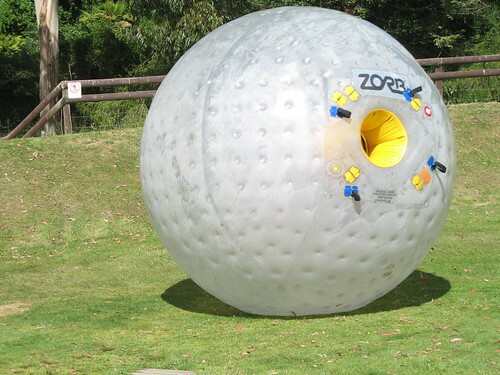 Zorbing seems a real exhilarating experience. I wish I get a chance to do it some day. 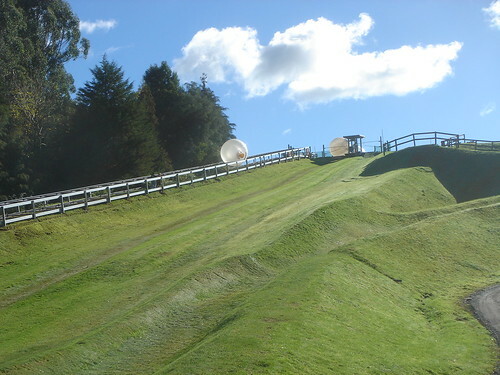 Nice pictures, I'd love to try zorbing in New Zealand, I've tried it a few times in England.